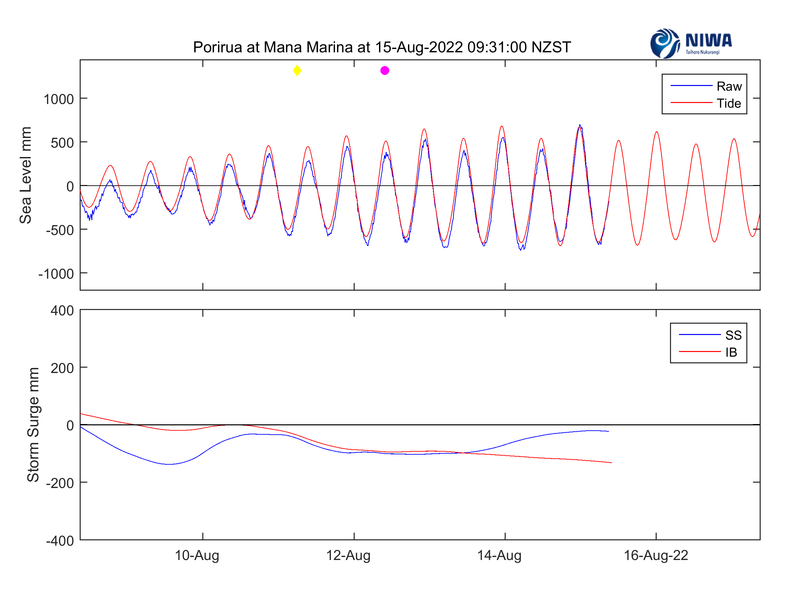 The upper plot compares raw data (blue) and forecast tide (red). When the two curves are aligned there is no storm surge, which is the elevation or depression of sea level as a result of meteorological conditions. But if the raw data lie above or below the forecast tide, it means we have positive or negative storm surge. The lower plot compares storm surge (SS) with inverted barometer (IB), which is derived from atmospheric pressure. When the two curves are aligned it means that the storm surge is being driven by local pressure changes. However, if they have different shape it means that storm surge is being driven by wind or waves propagating into the region from elsewhere. 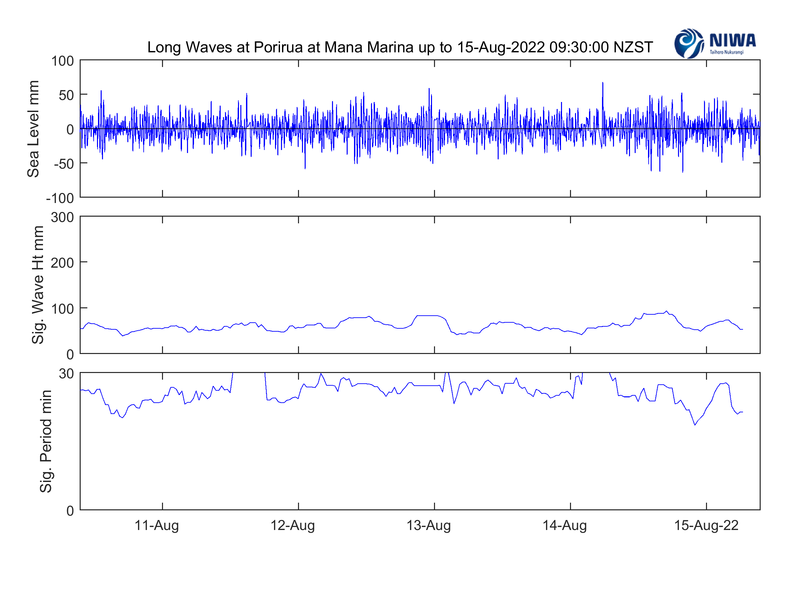 The upper plot shows the long-wave record, which has been calculated from the raw sea-level record by first removing the tide, then high-pass filtering. The raw sea-level record comes from the tsunami ring-buffer in the datalogger, where data sampled at 1-minute intervals are stored. Long waves have periods between 2 and 20 minutes and are barely discernible to observers other than with a plot such as this. Tsunami are a class of long waves that occurs from time to time. Tsunami are generated by earthquakes or submarine avalanches. The waves in this plot are another class of long waves generated by weather (winds and atmospheric pressure changes). The middle plot shows the significant wave height, Hs. This is the average height of the upper one-third of the waves in a 3-hour sample. The lower plot is the corresponding significant wave period, Ts. When Hs exceeds 500 mm and Ts drops below 10 minutes, we have a meteorological tsunami or rissaga. These are unnoticeable on a beach, but they are problematic for ships in harbours, where they strain mooring lines and cause difficulties for loading and unloading.